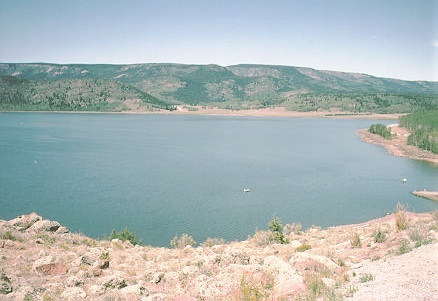 Johnson Valley Reservoir is approximately 3 miles northeast of Fish Lake on the Fish Lake Plateau off Highway 25. It is located in Sevier County. It is a shallow, intermediate sized impoundment of a mountain meadow. The reservoir shoreline is publicly owned and administered by the Fish Lake National Forest with unrestricted public access. Johnson Valley Reservoir is most easily accessed from U-25 at Fish Lake. Continue past Fish Lake on FS-640, which wraps around the north shore. An alternate access is on FS-036, a paved road beginning 2 miles north of Fremont on U-72.